Lasers are among the best tools available to give dermatology patients results that exceed their expectations. 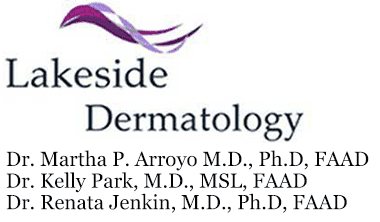 At Lakeside Dermatology in Libertyville and Gurnee, Illinois, Martha Arroyo, MD, PhD, FAAD uses lasers to treat a wide variety of skin conditions. Schedule your appointment to learn how laser therapy can give you the vibrant, glowing skin you’ve always wanted. Lasers may sound futuristic, but they’re just devices that emit beams of light and heat to penetrate the skin with precision. As the laser pulsates, it removes damaged skin layer by layer, allowing new skin to emerge. There are primarily two types of cosmetic lasers. Ablative lasers target the top and lower layers of the skin, stripping it away to make room for new, healthy skin. Because the skin is raw during recovery from ablative laser therapy, it requires excellent cleaning and care to heal properly. Ablative lasers can erase years of wrinkles and sun damage. Non-ablative lasers are not as invasive as ablative lasers and require less downtime. They target the deeper layers of the skin without disrupting the skin’s surface. You can wear makeup the same day after non-ablative laser therapy. Non-ablative lasers improve some skin discolorations and remove fine lines and wrinkles. For non-ablative laser treatments where the laser passes through the skin without removing layers, you only need a topical numbing cream. For ablative treatments that penetrate the skin deeply and remove layers, Dr. Arroyo may recommend a local anesthetic. You shouldn’t feel any discomfort during the application of the laser, which can take anywhere from 30 minutes to two hours, depending on how many areas are being treated. After laser therapy, Dr. Arroyo bandages the area. You need to clean the area frequently throughout the day. You should also apply petroleum jelly to prevent scabs from forming. Itching and stinging are common after laser therapy, but try to resist picking or scratching at treated skin. Cold compresses help reduce any swelling. Using the proper skin care products minimizes any redness you experience after laser therapy. High-quality moisturizers and sunscreens protect the beautiful new skin that appears after your procedure. To learn what laser therapy can do for you, call Lakeside Dermatology today.